I caught blue crabs, you assholes! Damn! Some of us just love those “limited edition” blu-rays and DVDs. It often doesn’t matter what the movie is. Those most rabid of rabid collectors will have purchased up every available copy before the more casual fan has heard that the damn thing was even being released. Some buy in the hopes of later flipping on eBay for a nice profit. Some buy just because a low print count somehow makes the item seem more important or “elite”. And then there are people like me. People that get upset that a movie about killer crabs that was filmed in Florida (Virginia Key, to be exact) had somehow managed to slip their radar for all these years and then buy it because they feel obligated to say that they have seen it. Released to Blu-ray in October 2014 by Scorpion Releasing with a limited run of 1,200 copies, Island Claws is a later entry in the deluge of killer animal/nature-gone-awry flicks that flickered on the screens of many 1970’s and early 80’s theaters and drive-ins. The film was directed by Hernan Cardenas (the only film he ever made) and was written by Ricou Browning & Jack Cowden. Browning is best known to horror fans as the man in the Creature From The Black Lagoon suit during underwater scenes. Cowden, however, will be remembered as the man who created one of the most repulsive, vile, despicable, loathsome monsters ever committed to celluloid. I’ve seen it. I don’t believe it. That’s right! 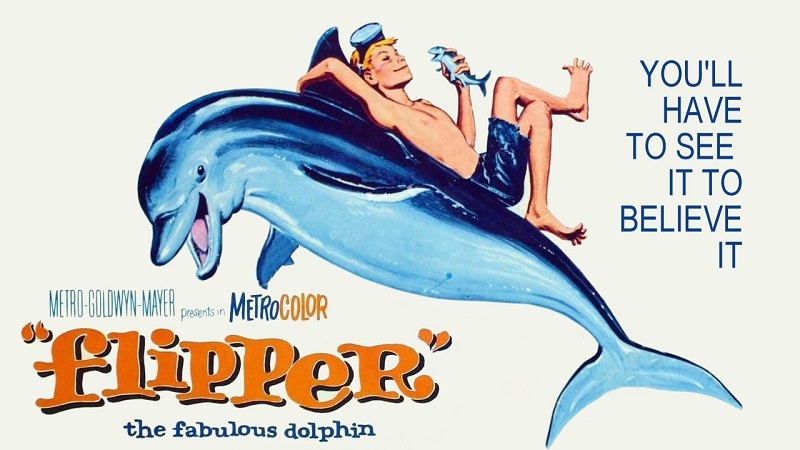 A horror flick from the man who gave us Flipper. Oh, joy. At a research lab in Florida, marine biologists are experimenting with ways to increase the growth rate in crabs. The scientists have discovered that crabs and shrimp living around a nearby nuclear power plant are maturing at an accelerated rate due to the heat generated by the plant’s generators. I’m willing to bet that the 46,000 tons of waste accidentally dumped into the water supply that morning probably helped. Anyone happen to have a giant coconut so we can fry this sucker up? The lab is trying to duplicate that process through a combination of heated tanks and growth hormones. Their hope is that some day the process that they are testing will produce bigger crabs with a shorter maturation cycle for use as an alternate food source to help in the fight against world hunger. And who can blame them? Them things look delicious! The bulk of the cast is introduced to us by way of a bar scene. The “colorful” locals of this small, dirt road, no traffic-light-having town are mostly fishermen. They spend their nights drinking in the bar as the local simpleton, Amos, plays his banjo. At one of the tables, a small group of men gather around placing bets as two of them take to racing hermit crabs. One of the crabs does a pretty good impersonation of Turbo, but the other doesn’t move. His one chance at greatness now blown to the wind, he never races again. He will later die alone and penniless in the bathtub of the motel room that he rents by the week. Cause of death: boiled for 5 minutes in a broth of water, pepper, lemon, onions, and Old Bay seasoning. The entirety of this scene heavily reminded me of the Half Shell Raw Bar in Key West, FL. Imagine my surprise when the characters walk out of the bar and there are the words “The Half Shell” written across the top of the building. As I did not see my father in this scene, I’m sure that it’s not the same place that I’m familiar with. 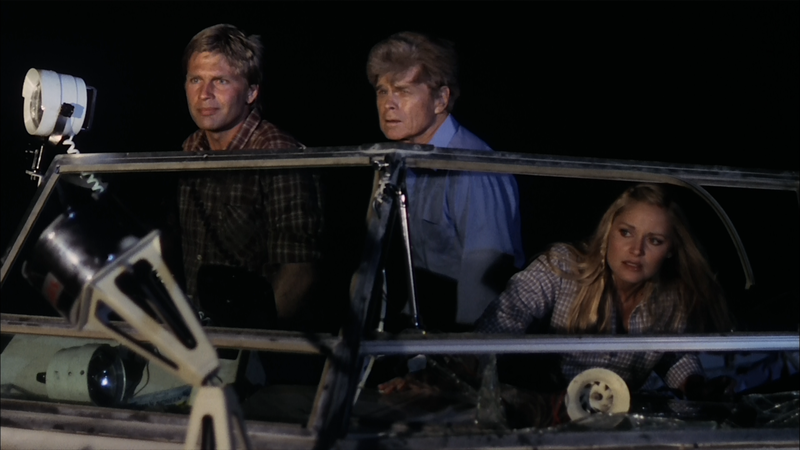 South Florida natives should also keep an eye out for the Potamkin Auto Sales advertisement on the back of the newspaper being read in this scene. Robert Lansing, star of other killer animal flicks such as Empire of the Ants & The Nest, plays “Moody”, the bar’s owner. Also introduced in this scene is the bar’s lone bartender and Moody’s love interest, “Rosie”, played by Nita Talbot (Puppet Master 2, Chained Heat). It’s interesting to note that while these 2 actors received top billing, neither of them are main characters, although Lansing has a more pivotal role. Horror fans may also recognize Friday the 13th Part 2‘s John Furey as part of the cast. There is also a sub-plot about a group of Haitian refugees that wash ashore on the beach late one night. They keep to themselves in the mangroves, but occasionally sneak into town to steal food and supplies. When hundreds of crabs swarm the school bus that Amos lives in, he tries to fend them off with his banjo. In the struggle, he knocks over a lantern and starts a fire that ultimately kills him. Some of the town’s residents blame the Haitians and their “voodoo crap” for Amos’s death and form a lynch mob to find them. 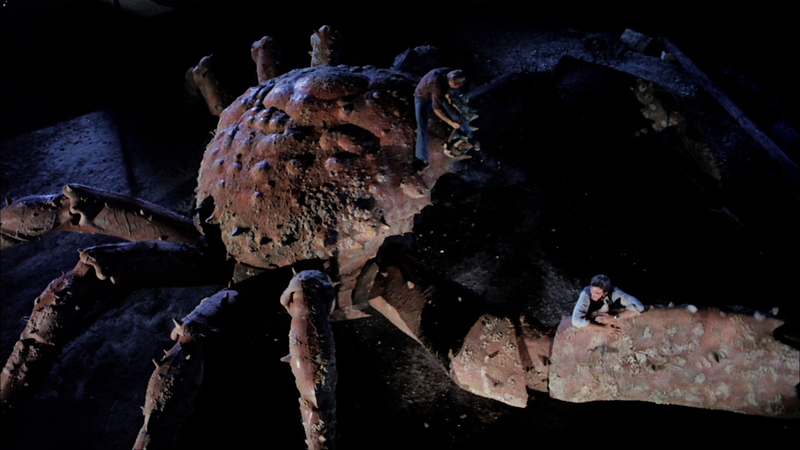 The crab attacks continue, finally culminating is a scene where the characters discover that at least one of the crabs has mutated to over 8 feet wide. 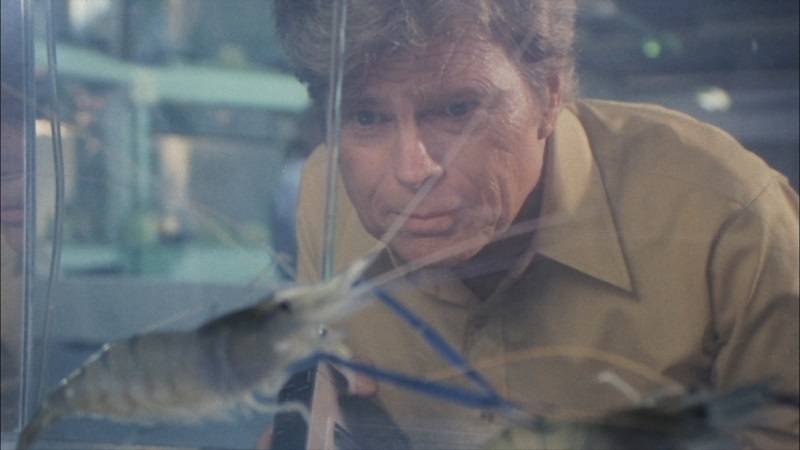 The film ends with the townsfolk fighting this massive crustacean. It’s worth noting that despite the low-budget, this effect is actually fairly well done. The thanks for that can go to special effects man, Glen Robinson, known for his work on FX heavy spectacles such as King Kong (76), Logan’s Run, & Flash Gordon. Despite it being a fairly bloodless movie, the filmmakers found a way to make these crab attacks intimidating. How you ask? Easy. Have dozens (sometimes hundreds) of real crabs on-screen with the actors. There are even a few scenes with extras filling in as the bodies of victims already claimed by the crabs, all while any number of crabs are crawling on and around the actors. Island Claws may not be the best of the “killer animal” movies, but it’s still a fun, solid movie. On the whole, the acting is serviceable, and despite a few minor hiccups, the movie moves at a decent pace. I’d recommend this more to fans of Frogs than I would to fans of Food of the Gods as it deals more with an abundance of crabs in their normal smaller size than it does with its one gargantuan “king of the crabs”. Island Claws is still a solid way to kill a lazy afternoon. Picture: Once again, a smaller label has put out an HD transfer that puts major labels to shame. There is no way whatsoever that this “low-budget, shot-on-16mm, no-one-remembers-it” film should look as sharp and damage free as it does. While there may be a hint of washout on some of the brighter daytime scenes, everything is amazingly clear and defined. Textures in hair and clothing aren’t to the point of making out every single strand or thread, but the fine detail is there. There is some issue with darkness obscuring the actors in poorly lit night scenes, but that is clearly inherent to the film itself and not the transfer. Daytime scenes of the beach are beautifully presented and even nighttime scenes still manage to display fine detail in trees and undergrowth, as well as on the crabs themselves. Special Features: The only special feature presented is an interview with Ricou Browning. Honestly, this is an absolutely pointless interview. Within the first 2 minutes, Browning admits that not only did he have no involvement with the production past writing the screenplay, but that he hasn’t even seen the movie. As far as I’m concerned, there’s no reason to continue paying attention past that. For those that do, the rest mainly deals with Salty, a movie about a seal that Browning also wrote. I will NOT be posting an Amazon link for this title as any copies found there will most likely be drastically over-priced. Yeah, I could post it and make a decent commission if someone bought a copy, but I’d rather point my readers towards the best deal I can find for them and not “the best deal for me”.